I went to Indiana and laid an egg. That sentence almost became the entire post because I simply can’t describe my race performance any better than that. I know how it happened, but I still don’t know why. It happened primarily because I failed 3 straight obstacles; two of which I usually never fail and the third that is 50/50. The traverse wall got me because of the mud on the blocks (should have selected a different wall). I failed the rope climb because….I don’t really know why. I just kept getting to the top and slipping down. I failed the spear throw because…..I don’t really know why. I just missed it. That meant 90 consecutive burpees that took lots of time and zapped my energy. It’s hard to do well at an obstacle race when you fail obstacles that you typically master. Before that stretch I had moved up to probably 20-25th place in the elite heat, but those failures and the extensive attempts at the final slippery wall dropped me out of the top 50. I was left with a humbling finish time, 2 bruised, bloodied, skin-bared knees, a severely sore left hamstring, cuts, scratches, and scrapes. More importantly, though, I was left with a stronger resolve to ramp up my training once the injuries heal. On the bright side, my Mud and Adventure teammates (Alexander Nicholas, Jillian Kenney, Tonya Graham Stodsgill, and Juliana Sproles) put on outstanding performances, so I’m going to ride their coat tails on this one! Besides the aforementioned egg-laying at Haspin Acres, the rest of the day and the race itself was spectacular. 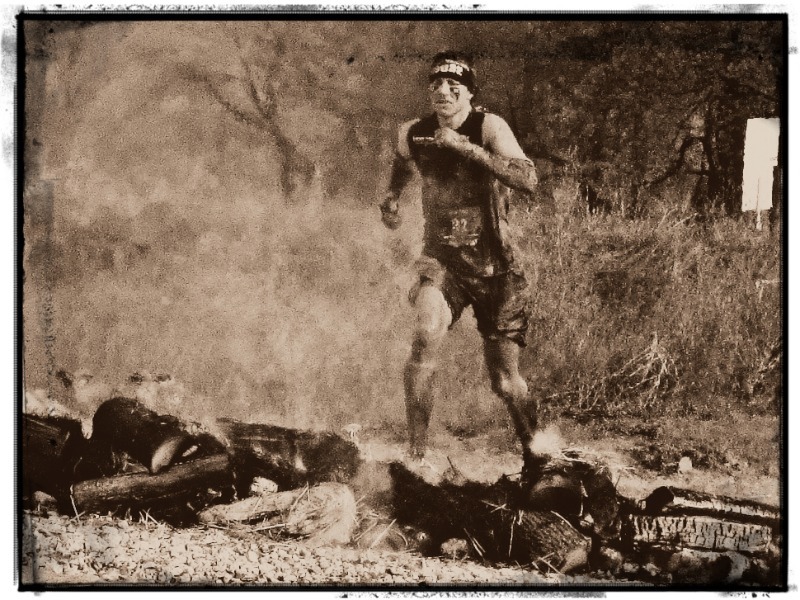 The 5.2 mile obstacle-dense race designed by my OCR buddy, Todd Sedlak was stellar. More obstacles than most sprints slowed the pace , but didn’t impede the flow. The running portion consisted primarily of fast-paced treks up and down rocky ravines, through narrow briar-infested creek paths, and over and through various hollows and mud holes. 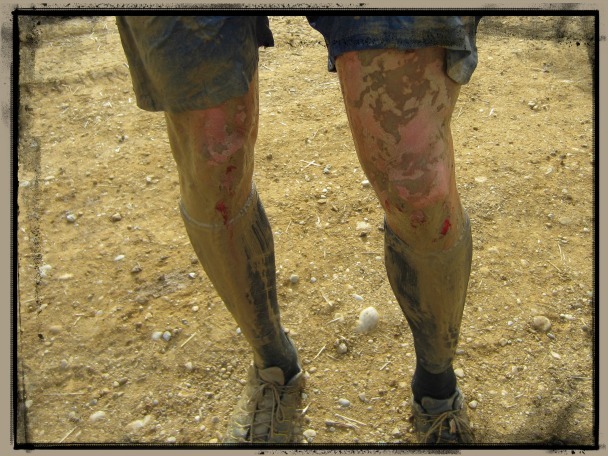 The slick and muddy barbed-wire crawl uphill was especially difficult, as was the slipperiest, slippery wall to date. There were the standard sets of 6, 7, & 8 foot walls, sandbag carry, Hercules hoist, atlas carry, balance walk over stumps, cargo net climb, and fire jump. The course was extremely well-marked and there was no guessing of which way to go. Check-in was smooth. Volunteers were helpful and well-versed in their duties. Parking was close and plentiful. Weather was not freezing. Hallelujah! Although this was the 2nd Spartan Race at this venue, it was completely different than last year, making it feel like a completely new race. I look forward to more Sedlak ‘signature’ courses. My wife ran the 10:00 heat with my fellow Cornfed Spartans (who are awesome by the way and notably the largest team at the race) and did really well. She tackled obstacles with relative ease and finished high in her age group. My daughter also ran the Spartan Kids’ Race, but I’m going to save that for a second post because it was literally the highlight of my day. As always, the reunion with old OCR friends and meeting new ones is a special part of these races. More pics and photos can be found on my Facebook page at http://www.facebook.com/onmywaytosparta. Hi Jeff, It was good to finally meet you if only for a brief moment. I also had a bad day on the obstacles. Could not get a grip on the wall. Spear went into the hay bale but fell out. And unbelievably had a hand slip off the monkey bars. (please tell no one) I brought a friend of mine who works for me and he finished 91st overall. It was his first spartan but he’s hooked now. My 13 yr old son ran his last JR. spartan and placed 7th taken down by some awesome little guys in green shirts and a tall girl. He actually is going to start running and working out. (he says) (tall girl humiliation) anyway I finished in top 4% overall so I’m really pleased especially since my knee was so swollen in Jan that I could hardly walk on it. I took my typical vow to never do another Spartan after this humbling experience however I’m now planning to do the one in Ill I think in July. I’m so glad you stopped the truck and chatted if only for a minute. I wish we could have met up sooner. I consider it a good thing just to be able to race after injuries and your finish was great! I’m considering the Midwest Super in July. It’s just a bad time for me, but we’ll see. Glad your friend has caught the OCR bug! P.S. I may or may not have given your son his medal. I was one of the leaders for one of the races and handed out medals on all three! Great write up of the race. Some days just don’t go as well as others. 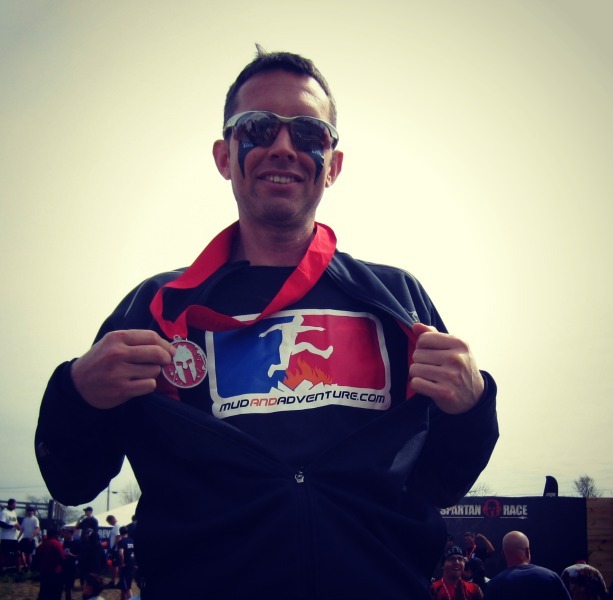 I look forward to reading about further updates and maybe seeing you at a future Spartan Race. Thanks, Chris. If we’re ever at the same race, make sure you find me! 90 extra burpes will throw anyone’s performance off, my hat’s off to you for completing it, and manning up and posting about it! Great write up also! Looking forward to my first Spartan this summer in Pa! You and I had a similar experience. The only three obstacles I struggled with were the same three for you. The 90 burpees destroyed my legs. It didnt help that I had the wrong shoes that by that point were each 5 pounds bricks. This was my first Spartan Race, and I am already prepping for my next by getting better gear and recruiting some co-workers. Btw, I loved the hill running and gully-dashing. Definitely my favorite part of the race. Also, I really liked the up-hill belly crawl because runners couldnt cheat and roll up-hill !! It was nearly impossible to roll up that hill!